Melt 8oz chocolate at 50% power until fluid. Periodically remove the chocolate from the microwave to stir. The chocolate must not exceed 113°F. Remove the chocolate from the microwave and continue stirring. Add 4oz of unmelted coins to the fluid chocolate, stir until all pieces are melted and the temperature of the chocolate has reduced to 89°F or 86°F depending on which chocolate you are working with. 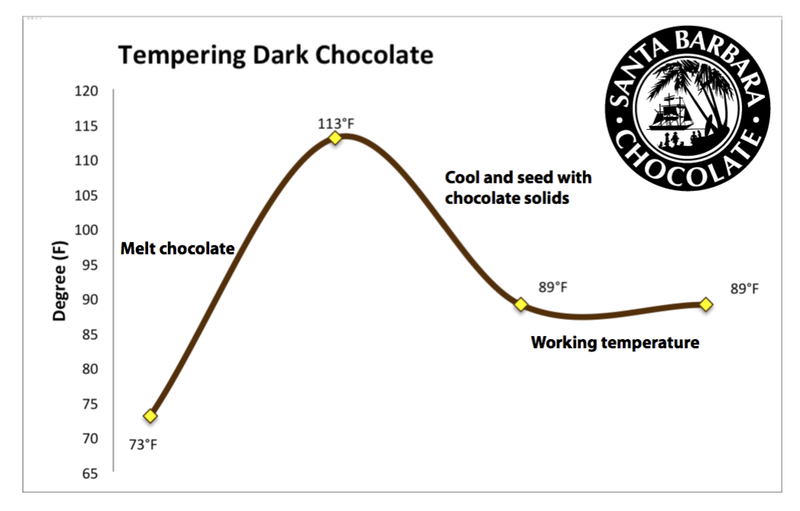 Once at 89°F - 86°F, the chocolate is now in temper and ready for molding, dipping or a variety of confectionery uses. Tempering with a table top machine can be tricky until you learn the process. Once the process is learned it is great and you'll be able to produce a lot more finished chocolates then you would using a double boiler. The table top temperers do not work like a fully automated tempering machine usually but rather as semi automatic machine that can assist you in chocolate production. Even big chocolate factories will have a small table top temperer in the research room to study the latest chocolate they develop. When working with a small table top temperer I have found the following to be true. I have not worked with all the models out there so I can't say this is an across board recommendation, but I have a feeling this will work for you and save you time. First, when tempering chocolate I would not drop the temperature of the chocolate to crystallization phase in a small non automated tempering machine. There reason why is the small non industrial tempering machines (machines with capacity less then 100lbs) generally do not have the motor or paddle robustness to temper properly. For an automated tempering machine to produce stable cocoa butter crystals either a water jacket or freon cooled kettle is important and very helpful. The air-cooled versions with fans will work but they don't seem to work as well. The other reason why I would not drop the tempering machine all the way down to the cocoa butter crystallization is it will take too much of your time and burn down your production schedule while the little machine attempts to properly crystallize the cocoa butter into a more stable situation. Just as a FYI regarding our organic chocolate: The organic 72% dark chocolate does not have soy lecithin added. As a result it is slightly thicker then one of chocolates with emulsifier where we add in a touch of Non GMO soy lecithin. Okay, below is how I'd temper our dark chocolate in a small table top temperer that heats with a light bulb and cools with an electric fan. In your table top machine melt the chocolate. Once melted and the table top bowl is rotating, drop the temperature to working temperature (87F). On the side of the paddle where there is no chocolate, add seed (unmelted chocolate wafers). The bowl will rotate and the wafers will slowly melt adding stable cocoa butter / chocolate seed to the melted chocolate. Keep adding stable seed slowly and in small increments allowing the chocolate to melt and until the machine reaches 87F. Allow the machine to spin a minute or two at the 87F before working to ensure the whole melted mass is in temper. Make sure there are no unmelted pieces floating in the melted side. While working if you need to ensure fluidity or a constant temper you can add small amounts of unmelted wafers to the side where there is no melted chocolate and the wafers will melt adding a constant supply of seeded in temper chocolate. This method is much faster than the table top tempering machine's fully automated 1 button (milk, dark or white) recommendations most likely. From my experience the small tempering machines do not work so great when it comes to tempering in a fully automated way. The reason why is beyond the paddle and motor strength, but also the way these small machines heat with a light bulb. This could heat unevenly so I recommend thinking of the table top tempering machines as a melter that helps assist your own tempering methods. 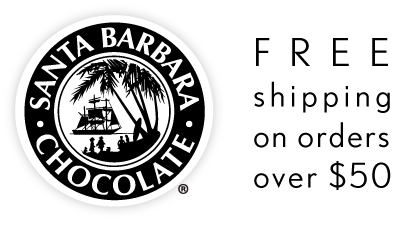 In general it is easy to temper all Santa Barbara Chocolates. 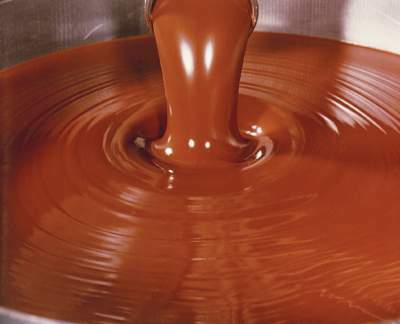 Small tempering machines when filled to full capacity can be a problem for chocolate tempering. If you have had problems tempering chocolate while using a small table top temperer, it might be related to the thermometer you are using mis-reading temps, the bowl being unevenly heated or left over unmelted chunks in the mass when bringing it back to working temp. Make sure there is no water or especially cold sections like ice touching the chocolate or bowl. If the chocolate is too thick you can always add cocoa butter to help thin the chocolate and make tempering easier. Simplest way to see if it is a thermometer mis-read, is to drop working temp by 2F. Small temperer problems: Most small temperers use light bulbs for heating and often they do not work correctly with the built in thermometer. Light bulbs just don't work well with tempering because even though the bowl rotates the bulb heats too much in a localized area and not evenly across the whole bowl or all the melted chocolate. 2) If in doubt about the chocolate - hand temper a small batch to ensure confidence. 3) The thermometers on the small temperers are not so accurate because of the shape of the bowl. Dark chocolate is best worked with at 87-88F. If the temper thermostat is over heating some part of the melted chocolate, the whole mass will be out of temper. You can try lowering the set temperature by 2F and see if this helps. Work at a lower capacity and test the melted batch down low inside the bowl close to the heat source with a separate accurate digital read thermometer to see what is happening. The bottom line is your business will be successful if you have the right tools. Small consumer temperers are not capable of keeping up with chocolate production and with the small machines you will be pushing the limits of what this type of machine is capable of doing. Is there more than one way to temper chocolate? 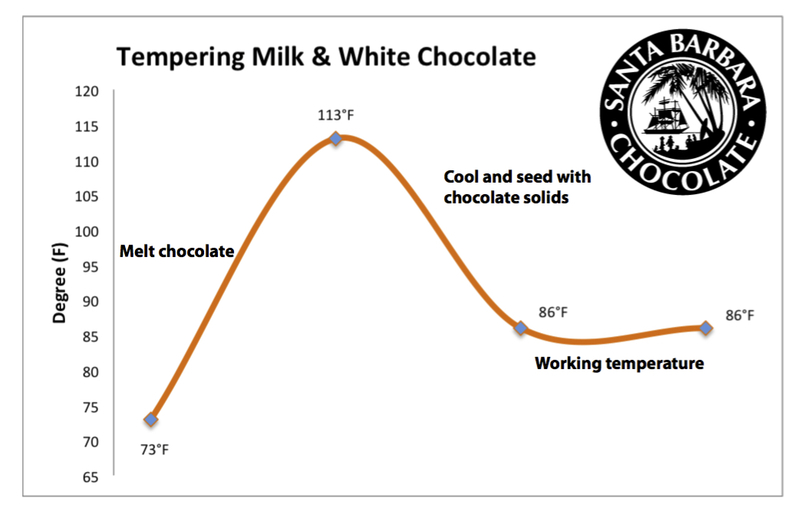 Just in case your chocolate did not come out the way you were expecting the first time you tempered your chocolate, below is an alternative chocolate tempering method that works wonders! Melt your chocolate over low heat (double boiler works perfectly), stirring constantly. When it is melted with no chunks, remove from heat. Pour between 30% to 50% of your melted chocolate onto smooth surface such as marble or granite. Work with a large spatula to spread out and then scrape together. Keep spreading and scraping the chocolate over until it cools to about 84°F and starts to thicken with small chunks appearing. When the cooling chocolate is thick with a dull finish, the chocolate is called "seeded", which means the cocoa butter crystals are forming in a proper aligned way. Add your seeded chocolate to the melted warm chocolate and stir until smooth. Once all mixed and smooth, the chocolate mass in the bowl should be 84-89F. Try the drop test to see temper: drop a bit of chocolate onto a plate and cool for 3 minutes. If it is glossy and firm with no streaking after the 3 minutes, it is tempered. If you use candy molds, make sure they are slightly cooler than the tempered chocolate. Tempered chocolate is glossy and smooth and will harden with a beautiful shine.